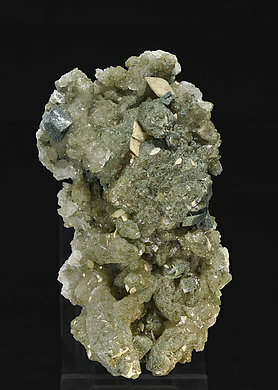 Very sharp thin laminar light cream-colored crystals of Titanite on a group of deeply chloritized Quartz crystals partially coated by small Orthoclase (adularia) crystals. The locality is considered an European classic. Very perfect floater with a very evident contact twin, transparent, bright and with a very intense and uniform color. 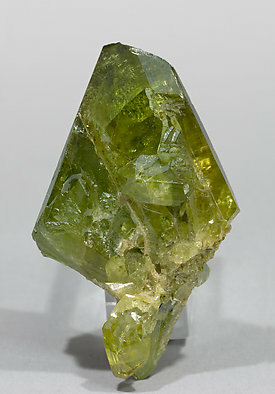 Twinned translucent crystal, transparent at the top termination and with an excellent yellow-green color. 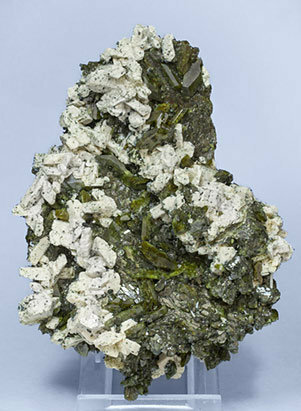 Floater aggregate of twinned crystals. 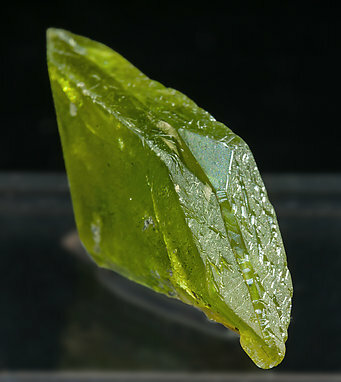 They are between translucent and transparent, very bright, and with an intense yellow color with greenish reflections. Several crystals, one of them clearly dominant, and showing the typical Titanite twinning. They are on matrix, and have excellent luster and a nice green color. 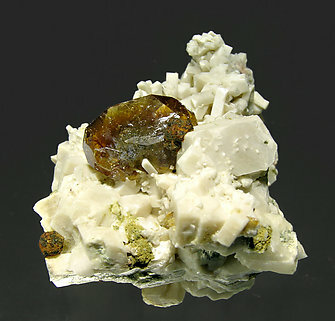 An extraordinary specimen, which has two twinned crystals on matrix of white Albite. One of them has a very unusual form, they are perfect, and have absolutely no dings or even abrasions, which in this a small miracle given how aerial the crystals are and how difficult it normally is to get undamaged material from this region. On top of that they are very gemmy and the color is both more lively and appealing than is typical for these Titanites. 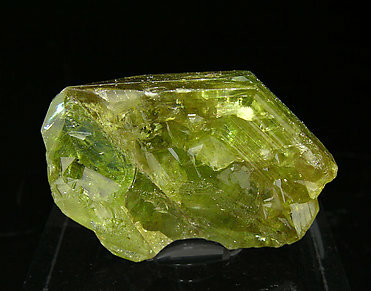 A photo of this specimen was used in our advert that appeared in the Extra-Lapis English edition on Pakistan-Afghanistan. 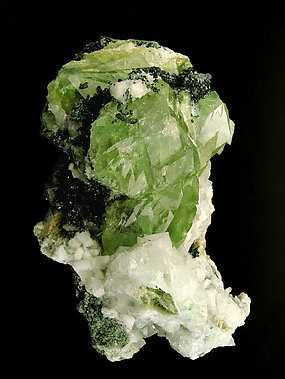 Group of flat crystals, with an excellent rich green color and intense brilliance on a matrix of Calcite crystals. A novelty at Sainte Marie-aux-Mines 2016. 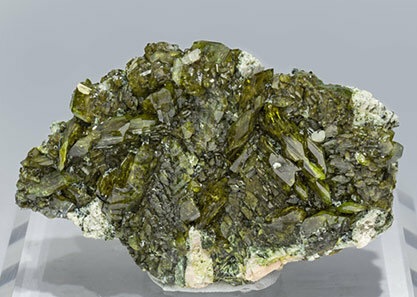 Platy Ilmenite crystals with irregular contours and completely pseudomorphed by Rutile, coated by very sharp Titanite crystals that are bright, with very well defined faces and edges, and with a very apparent pleochroism that shows a yellow color under led light but is greenish with daylight or neon light. 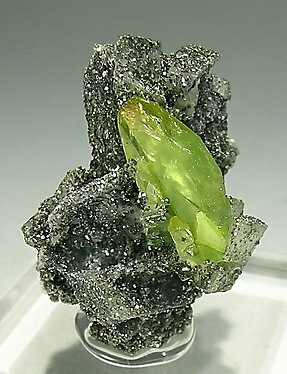 Partially coated by Microcline crystals. The process of replacement of Ilmenite by Rutile seems very similar to that of other localities with similar geological conditions (by example the Zambian Rutile) and it is due to hydrothermal processes at the site. We’ll send to the buyer a copy of the analyses done on the different species present in the samples. A novelty at Sainte Marie-aux- Mines 2016. 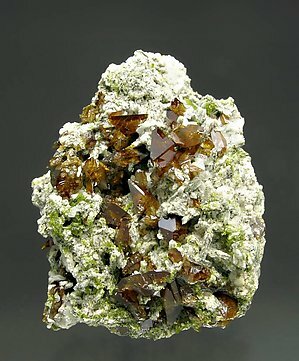 Characteristically platy Ilmenite crystals with irregular contour and completely pseudomorphed by Rutile, coated by very sharp Titanite crystals that are bright, with very well defined faces and edges, and with a very apparent pleochroism that shows a yellow color under led light but is greenish with natural or neon light. A novelty at Sainte Marie-aux-Mines 2016. 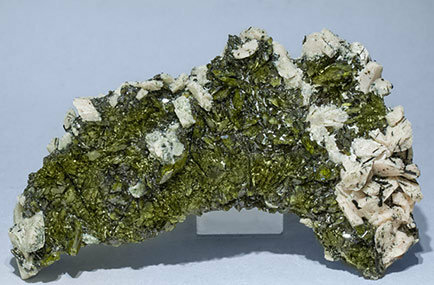 Platy Ilmenite crystals with irregular contours and completely pseudomorphed by Rutile, coated by very sharp Titanite crystals that are bright, with very well defined faces and edges, and with a very apparent pleochroism that shows a yellow color under led light but is greenish with daylight or neon light. 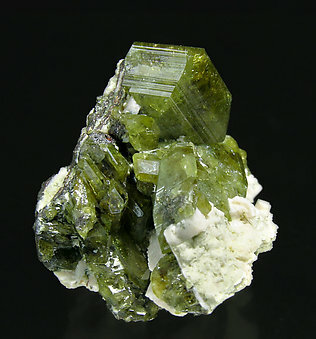 Partially coated by Microcline crystals. A novelty at Sainte Marie-aux- Mines 2016. 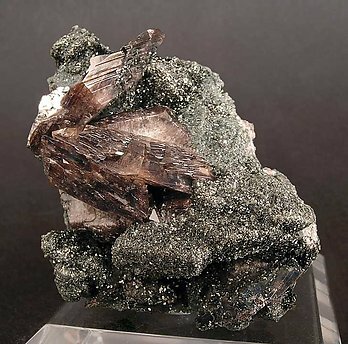 Platy Ilmenite crystals with irregular pseudo-hexagonal contour and completely pseudomorphed by Rutile, coated by very sharp Titanite crystals that are bright, with very well defined faces and edges and coated in the back by Microcline crystals. 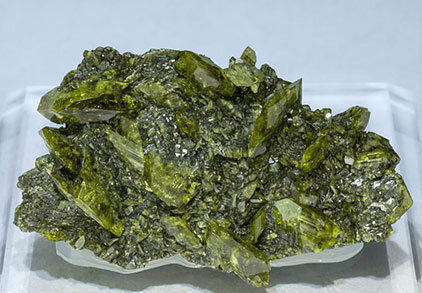 The Titanite crystals have a very apparent pleochroism that shows a yellow color under led light but is greenish with natural or neon light. The process of replacement of Ilmenite by Rutile seems very similar to that of other localities with similar geological conditions (by example the Zambian Rutile) and it is due to hydrothermal processes at the site. These samples, very different from the Titanite previously known at Imilchil, have required an accurate analytical process. We’ll send to the buyer a copy of the analyses done on the different species present in these samples. A novelty at Sainte Marie-aux- Mines 2016. 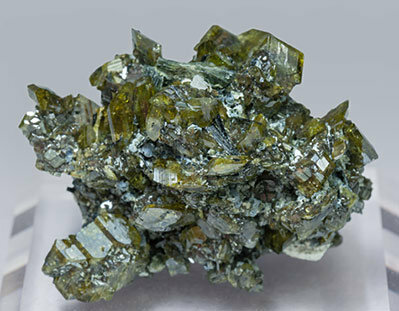 Characteristically platy Ilmenite crystals with an irregular contour, pseudomorphed by Rutile and completely coated by very sharp Titanite crystals that are bright, with very well defined faces and edges, and with a very apparent pleochroism that shows a yellow color under LED light but is greenish with natural or neon light. 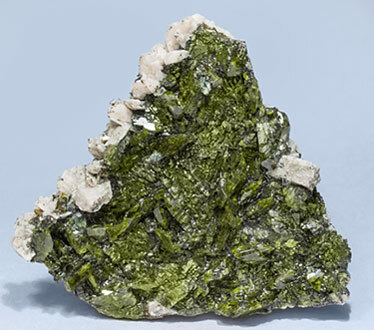 The process of replacement of Ilmenite by Rutile seems very similar to that of other localities with similar geological conditions ( for example the Zambian Rutile) and it is due to hydrothermal processes at the site. These samples, very different from the Titanite previously known at Imilchil, have been analyzed and we’ll send to the buyer the information and documentation previously obtained about the process and also a copy of the analyses done on the different species present in the sample. 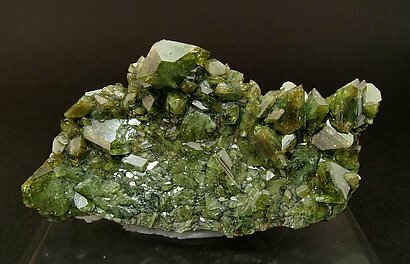 The new Titanite from Imilchil, with darker brown crystals, very acute and extraordinarily bright, transparent and on Albite matrix with small acicular crystals of Epidote. 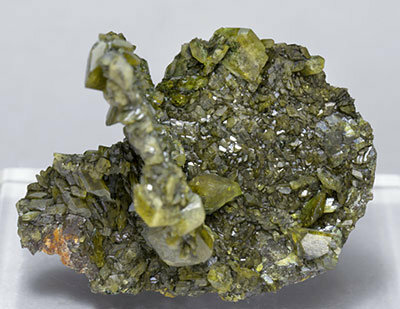 A crystal of Titanite of good size, very well defined, with curved faces and edges and completely chloritized, probably by Clinochlore. A classic. Excellent miniature. Twinned crystal with a good color and brilliance. 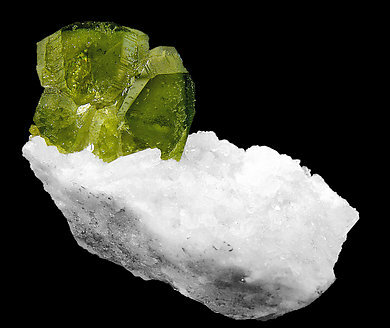 On an Orthoclase (adularia) matrix partially covered by Clinochlore. 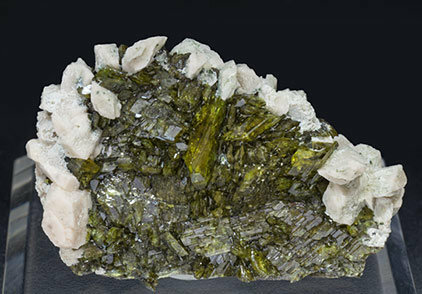 Typical crystals from Imilchil, of very bright and well defined faces and edges and a color between green and yellow, on Feldspar matrix. 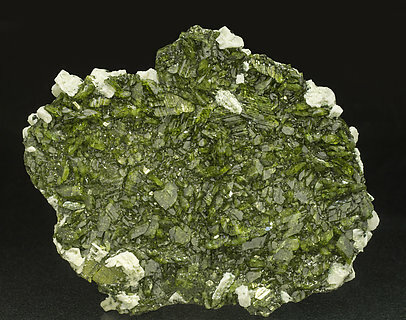 The new Titanite from Imilchil. A flat dark brown transparent crystal of perfectly defined faces and edges. 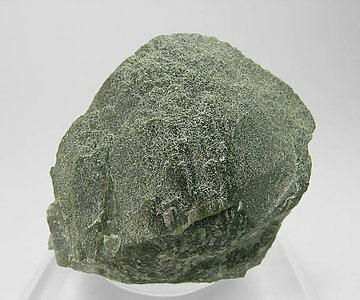 The matrix is a group of very well defined Feldspar crystals. A very attractive novelty from the prolific zone of Imilchil. 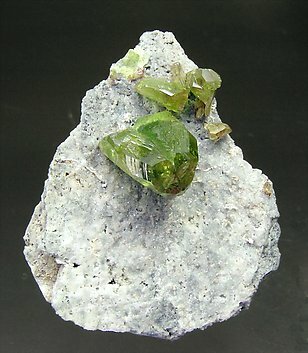 The crystal profile is very different from the other classic localities of Switzerland or Pakistan. The forms are simple, not twinned, and the color and brightness are excellent. 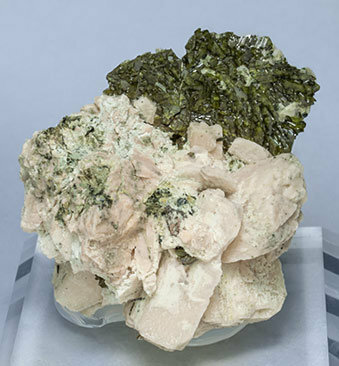 The specimen is a floater and its back side is covered by white crystals of feldspar, probably Albite. 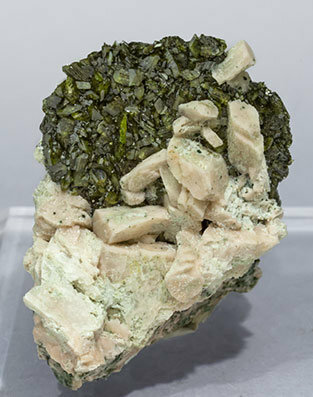 Large well defined undamaged crystals that are well positioned on the Mica matrix. Pleasing price-quality balance.